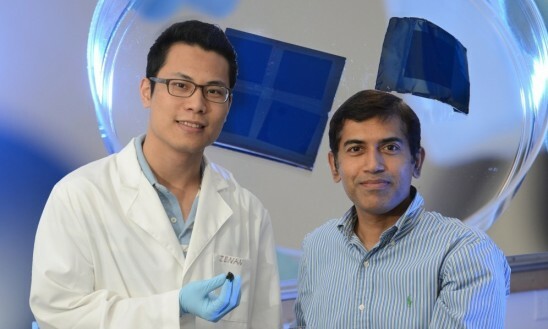 Doctoral Student Zenan Yu and Professor Jayan Thomas hold samples (also magnified in the background) of nanopillar structures they successfully printed. A very exciting discovery! I'm not a scientist, but I enjoy reading about science. The nanopillar structure of super capacitor electrodes reminded me of villi lining of the small intestine to increase its surface area. It would be helpful if a diagram or image accompanied this text to help explain this great discovery. Is this nano 3-D printing?